Hunting with birds and hounds has always been considered an art. The actual course of hunting, graceful movements of animals, and the emotions and passions of the hunters made it a festival. A steppe hunter derived great pleasure from the tandem of a dog and a hunting bird. The Sunkar nursery, working with almost all kinds of hunting birds, operates in the Alma-Arasan gorge near Almaty. 160 km from Almaty is the Berkutchi (Eagle hunting) museum where complete information on the history of this kind of Kazakh hunting is available. Golden eagle hunting is one of the oldest methods of food hunting. Our ancestors in the Eurasian steppes mastered eagle hunting several thousand years ago, in the Andronov age. Proof of this fact comes from Bronze Age petroglyphs. In the west of Kazakhstan (in the Atyrau region in Aktobe gorge) a second "Golden Man" was found. His precious golden eagle was buried beside him. Eagle hunting was mainly practiced in the northern and central regions of Kazakhstan, while in the south hunters preferred to use hawks and falcons. Each bird was intended to hunt a particular type of animal. Apart from foxes, golden eagles usually catch corsacs and hares. Strong, rapacious, well-trained eagles proved useful for hunting hoofed animals and even wolves. Hawks are used for geese and bustards. Sparrow-hawks are as a rule used for hunting hares while goshawks are used for quail. Falcons and merlins proved to be excellent for hunting smaller birds. In the past, hunting birds were extremely expensive: a good golden eagle could cost 5-6 camels and a falcon cost 1-2 camels. Eagle hunting season starts with the first night frosts and continues from November through February. This schedule was set in olden days because furry animals have the best fur in winter. Falcon and Merlin hunting starts in late September when birds are preparing for migration and lasts until the first snow falls. As a result of several centuries of selection, people of the region have developed a special breed of hound. Its distinguishing features are an outstanding ability to chase prey, sharp-sightedness, and speed. Mostly, tazy are used to hunt hares, badgers, marmots, foxes and wolves without guns. Tazy are beautiful, graceful and elegant dogs with a sense of dignity. The word "tazy" can be translated as "clean". Kazakhs of the past maintained a special treatment for these dogs: the tazy was designated a special place in a yurt covered with a warm soft cloth, and a special felt sack was taken to each hunt to keep the dog warm during hunting. As a legend says, an excellent tazy was once accepted as bride price in place of 47 horses. People from all over the world come to Kazakhstan to obtain valuable antlers of hoofed animals. Thanks to the giant deer inhabiting the Jungar Alatau, Kazakhstan has acquired the worldwide reputation of "a country for hunting". Hunters from overseas are delighted with the antlers of the Tien Shan maral. They may weigh up to 11-15 kg and can be very impressive. Trophies of Kazakhstani safari are elks, roe deer, wolves, saigas, wild boar, jeirans, and Karaganda, Jungar and Tien Shan argali (Central Asian sheep). The Kazakh names of the Golden Eagle. For ages the Golden Eagle has been used as a hunting bird. Hunting with Golden Eagles is specific, at the present time, and done by expert hunters (berkutchi). Hunting with Golden Eagles requires special knowledge and patience. The berkutchi names the Golden Eagle depending on its age: up to 1 year - balapan, 2-year - kantubit, 3-year - tyrnekl, 4-year - tastulek, 5-year - muzbalak, 6-year - koktubit, 7-year - kana, 8-year - zhana, 9-year - maytubit , 10-year - barkyn, 11-year - barshyn, 12-year - shogel. 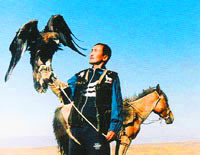 Hunting with Golden Eagle is one of the most unique features of Kazakh life. The hunter is named kusbegi or berkutchi. The experience of wild bird training was gained by Kazakh kusbegi over centuries, the secrets were imparted from father to son and kept very secret. At the present time we can meet few people with such knowledge. These masters have an innate gift for wild bird training. For hunting they tame falcons, golden eagles and eagles. Names of birds are given depending on their appearance and battle characteristics. Hunting with Golden Eagles has been practiced for ten centuries. To present a teenager a nestling of a hunting bird, was considered to wish to him to begin courageous, strong training. To train a golden eagle - is a high art. The captured bird gradually becomes accustomed to the owner. For this, the berkutchi some nights doesn't close his eyes and prevents the eagle from sleeping. The bird can eat (bits of uncooked meat) only from the hands of the owner. After a while the bird will get used to the hunter and his horse and dog, and begins to train to hunt for a stuffed fox and only then the real hunting begins. The specially trained golden eagle hunts for small animals: rabbits, foxes, partridge, and black hazel grouses. Equipment for hunting with hunting birds. For hunting with hunting birds specially prepare equipment: a coverlet, cap, cushion and leash. Bardak - a special wooden shield for the hand - try without it to hold on your outstretched hand a bird of 6-7 kg! Shyrga - skin of a hare or fox filled with straw. This is like a textbook for a bird. The hunter drags the shyrga with a long rope on the steppe and teaches the golden eagle to attack its prey. Kusbegi must have inexhaustible patience and persistence.